a) 24mm wrench for the valve cover access plugs – a 15/16 wrench will work but fits very tight. c) two large washers that are used as a screwdriver to unscrew the two access plugs on the left side cover. Do not use a large screwdriver. 2) For the crankshaft cover (the lower cover) – washer .090 thick x 1” to 2″ diameter. It might be a good idea to try to loosen the timing mark cover (the upper cover) before the day you intend to do the valve adjustment. Mine was very tight and I wasted a lot of time trying to remove it. 1) Use a washer (.060 thick x 1.25 to 1.5 inch diameter) as a screwdriver to remove the timing mark cover. 4) Loosen the access plug, then re-tighten it snugly – not too tight. Now it will be easier to remove on the day that you do the valve adjustment. Make sure that the fuel petcock is “ON” or “RES” (not “Prime”). You do not need to drain the tank. Remove the two 8 mm head bolts on each side – the left side holds the petcock and the right side holds the fuel pump to the tank. Remove the rear bolt that holds the tank to the frame. Before removing the tappet access plugs, carefully clean the area around them. Same for the spark plugs – clean around them before removing. A toothbrush and compressed air work well for this. Remove the tappet access plugs – you need a 24mm wrench – a 15/16 wrench will work but fits very tight. Remove the crankshaft cover (the lower cover) – using a washer .090 thick x 1” to 2″ diameter. This cover is plastic and is easy to remove. Using a 17mm socket, rotate the crankshaft counter-clockwise. If the valve needs adjustment, loosen the locknut (8mm wrench), and then turn the adjuster (3mm wrench). A small movement (approx. 1/8 turn) is usually all you need. Then tighten the locknut and measure the play again. If it is not in spec, adjust the valve again. After you tighten the locknut, always measure the play again. Repeat steps 9 and 10 for the rear cylinder. Using a 17mm socket, rotate the crankshaft counter-clockwise. Stop when the pointer lines up to the ” │ ” mark . This is Top Dead Center for the rear cylinder. When complete, put everything back together. Before re-installing the spark plugs, apply anti-seize to the spark plug threads. Torque the spark plugs to 8.4 ft lbs. I use this setting for my bike, and it did not increase the amount of valve clatter noise. How long does the job take typically? The prep work (steps 1 and 2) takes one or two hours. Make sure you do the prep work several days before you do the valve adjustment. The actual valve adjustment (steps 3 to 13) takes two to four hours. Some people can do it faster, some slower. For a person doing a valve adjustment for the first time, I would just figure half a day. Hi Ron, The Virago 250 has had very few changes for 20 years, but I did not know for sure if the valve clearance was the same. Virago 250 valve clearance is .08~.12mm intake and .10~.14mm exhaust from a 1994 manual repair. A Yamaha service department has verified that the valve clearance of a 2014 Virago 250 is the same as a 1994. Have any of you owners considered a cam change? Maybe .020″ more lift & possibly a duration increase of some degrees? Maybe CRANE or another co. could regrind a stock cam…also, is there a drag bike class for 250cc engines? New to this site, non-owner, but still considering after 1 yr. 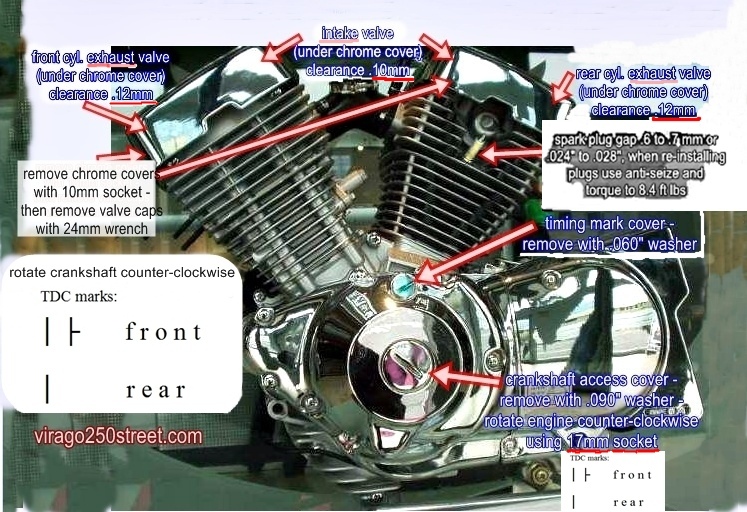 If you go on the Virago Tech website, there are a few people there that have put in a hotter cam and post their 1/4 mile ET. For me, I would not change the cam – because the Virago 250’s good mid-range torque is part of what makes the bike so great. To me, the Virago 250 seems faster than it really is because of the good mid-range torque and because the engine is so responsive. So there is absolutley no noise, no rattling and I will get better performance of the bike ? How much performance and did you had any issues since your last adjustment ? And how on earth you found out that ? I read it on a forum years ago- probably the XS650 or Hypermilers forum. It makes sense to set the valves on the high side of the range – too tight valves will add drag and could damage the engine, and loose valves can draw in a little more fuel mixture. I did not notice any extra noise or rattling, but if your engine is worn or the valve adjustment is a little high, it could rattle – but probably not much. The performance increase is subtle. You probably won’t notice this one change, but if you do it in combination with other changes (like higher tire pressure and iridium spark plugs), you might notice it. I tried to do as you mentioned and I failed. Mostly because you forgot to mention 2 very important things about valve timings. 2. The timings should be adjusted when cylinders Top Dead Center is in a phase of COMPRESSION ! This one is the most important. That is why you mentioned that it has to have some play in it, but not the reason why. Please update your blog here so other pople don’t spend 5 hours trying to figure out where did it go wrong. 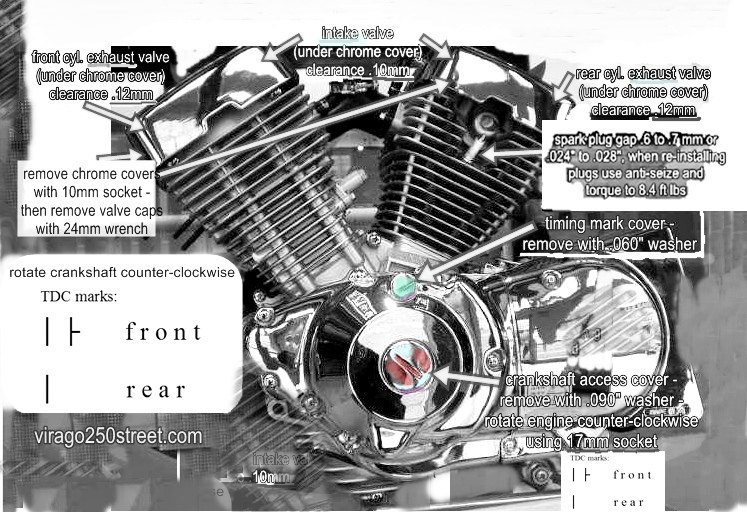 The “clockwise” thing is an error in the Virago 250 shop manual. Also, you can do a valve adjustment without understanding TDC. Go to the mark, if the valves are too tight, rotate the engine around to the same mark and you are at TDC. Also, I am not a fan of removing the spark plug and then sticking a screwdriver into the cylinder to find TDC. that what I thought, should rotate counter clockwise.